This is our first entry level presentation scanner with RFID capabilities. Its fast and reliable scanning is also easily configurable to your needs. CipherLab USA, a global leader in the design, manufacture, and marketing of Automatic Identification and Data Capture/Collection products and systems, will showcase its latest Mobility and Scanning Solutions at RetailNOW 2018 in Gaylord Opryland Resort & Convention Center in Nashville, Tennessee at booth #318 from August 5-8, 2018. CipherLab will have the mobility and scanning solutions for retail on display. CipherLab’s 2200 series’ omnidirectional scanning capabilities offers environments such as convenience stores, supermarkets, department stores and even airline check-in counters a hands-free operation which allows scanning to be continuous and efficient. mobile computers deliver superior functionality and accurate performance. CipherLab provides both solutions for replacing existing Windows mobile computer or consumer grade smart phone. Its compact size and footprint make it the perfect solution for space-limited environments. With flexible installation and ability to bend 45 degrees forwards and 15 degrees backwards allow barcode reading at awkward angles. CipherLab’s 2200 series have three models with separate features for barcodes, barcodes with EAS and barcodes with UHF RFID for users to choose from to fit their needs. The 2200 series EAS can also relieve you of the need to buy additional deactivators. All of 2200 series’ features are protected against water drops from frozen/cold items with an IP52 rating. Its 1.5 m drop resistance allows users to operate without worrying about accidental drops and bumps, regardless if it’s from applications such as point of sale, baggage drop-off points, boarding gates, etc. 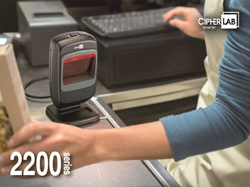 CipherLab’s 2200 series simply makes scanning fast, reliable and easy. “This is our first entry level presentation scanner with RFID capabilities." Luis Wu, Vice President and General Manager of CipherLab USA said, "Its fast and reliable scanning is also easily configurable to your needs."